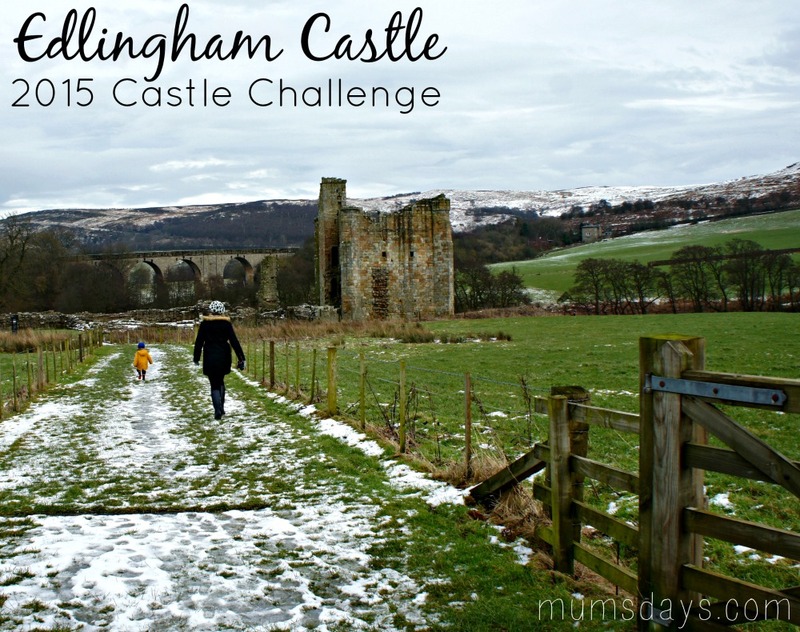 Last Friday, Reuben and I met up with Emily and Beau for another Northumberland Castles instalment, this time to Edlingham Castle, which I had to keep referring to as ED-LING-HAM, because I really wanted to call it something else. Nothing rude, just something else! I called ahead to make sure we could visit and was advised it was “open any reasonable time during daylight hours”, which is what it also says on the website. But nevertheless, I had it confirmed that this meant, yes, we could go on a Friday around 11:30-2ish – well, I wasn’t going to risk a repeat of last week’s disastrous visit to Widdrington Castle! Reuben kind of has the days of the week down; he knows he sees Grandma and Grandad on a Monday, me on a Tuesday, Susan the childminder on a Wednesday and Thursday, and so by the time Friday comes around he’s started to tell me that on “Friiiiday we see Emily and Boat and we go a caaaaastle”. It doesn’t take long to establish a new routine and apparently Reuben loves a routine! So, as it was Friiiiiday, we headed off to Edlingham Castle almost certain that we’d all get lost somewhere in the wilderness (a mere couple of miles from Alnwick, but certainly somewhere I’d never been before) because Emily and I were travelling from different directions, and if you remember from last week’s trip to Druridge Bay, Emily’s sense of direction isn’t always on the money. Neither is mine. Once we had driven through the delicious sounding Longframlington (reminds me of marzipan for some reason), there was a right turn that seemed as though it would never come. It eventually did and then we (or I, as Reuben was fast asleep by this point) felt like the intrepid explorers, driving a high and winding road at about 3 miles an hour with a BMW up my bum, trying to workout where to turn left into Edlingham. Thanks to a good ol’ Heritage signpost, it was really obvious where to turn left and there it was, Edlingham Castle in all its glory. If I wasn’t such a chicken, I would have stopped on that steep bank to take a photo down into the valley as it was stunning. But I worry about things like pulling over. I like to have a designated car parking space. Once I arrived at “Edlingham Castle and 11th Century Church”, as the signpost put it, it was snowy and there was only grassy verges to park (note my aversion to parking in non-designated spots gets worse when there’s snow) I started to panic about the car getting stuck outside this old, spooky-looking church but I managed to turn around and all was well as I waited for Em and Beau to arrive. 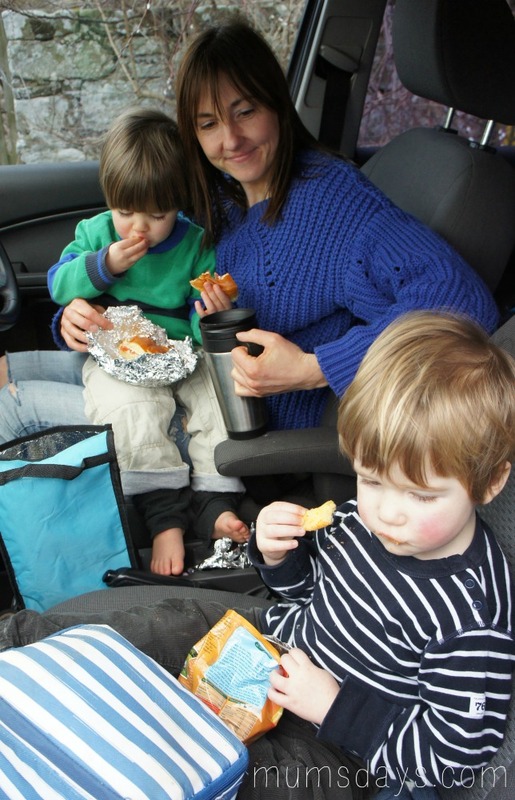 Both boys slept on for a wee while, so Emily and I had a catch up while enjoying some coffee (another key lesson from last week’s castle visit was to bring provisions), then once the boys had woken up it felt only right to start off with an adventure picnic (also known as eating a sandwich in the car). 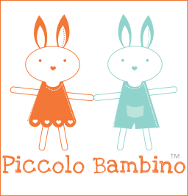 The picnic followed by ‘getting ready to explore’ probably took the best part of an hour but then we were ready to go! 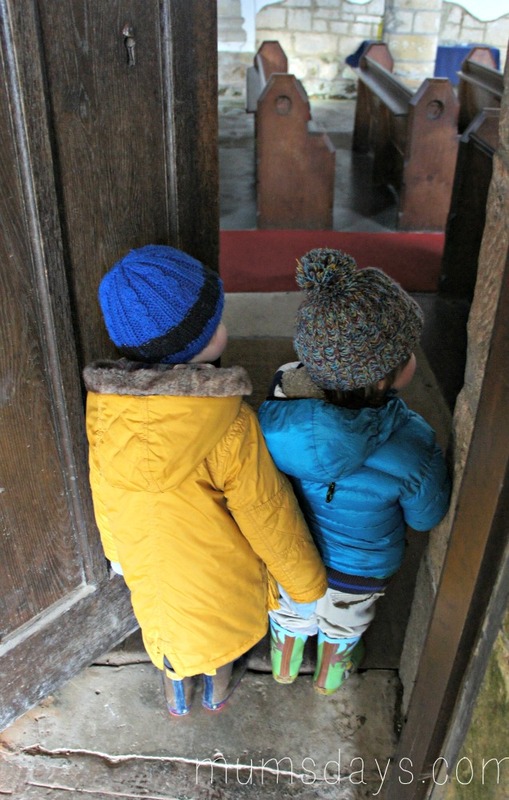 Off down the icy path we went and decided to visit the 11th Century Church first (that is seriously old man! ), with the promise of finding a leaflet about Edlingham Castle in there. 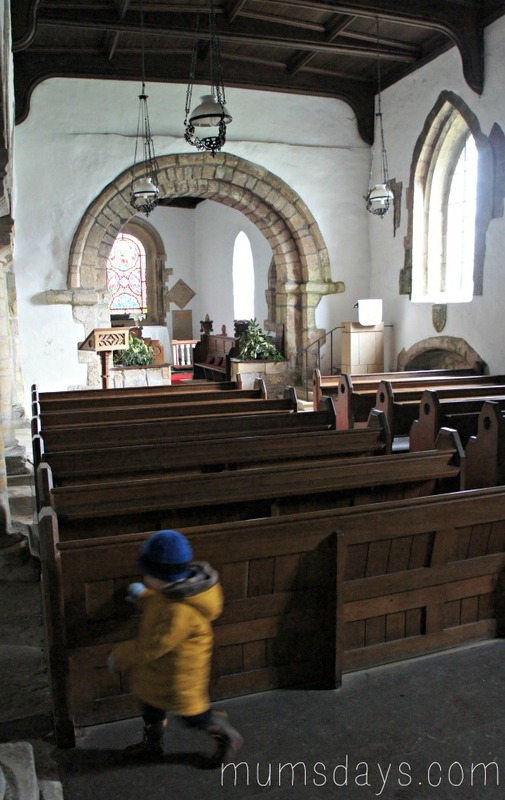 Now, being the daughter of a vicar, I’ve spent a far amount of time in empty churches, so they don’t really phase me. 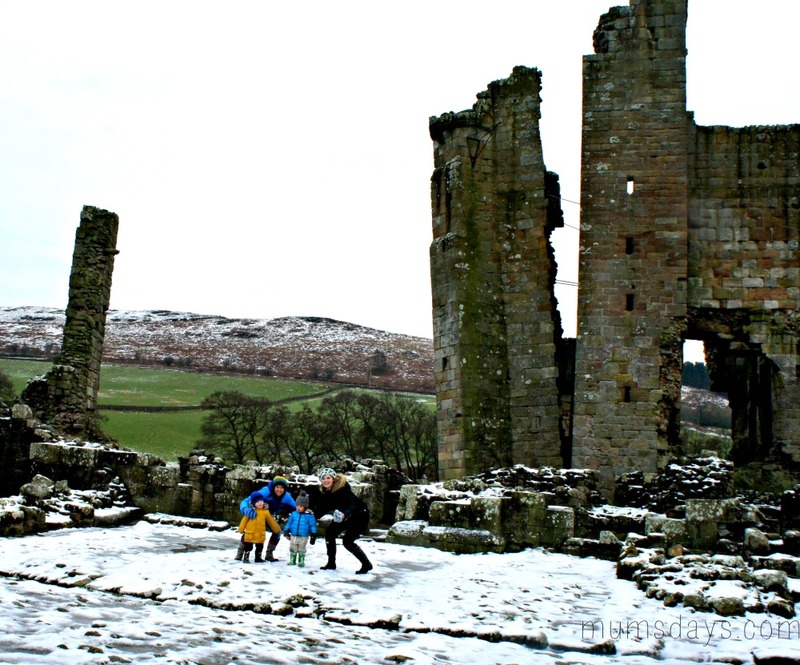 Empty churches, in the snow, near a ruined castle, in the middle of nowhere on the other hand…I’m not going to lie, it was a little spooky! Especially as there was one more car parked on the little road, so I can only assume that the vicar was ‘in’. It was a gorgeous church though and I certainly had a moment imagining Elizabeth and Darcy tying the knot. Not that they’d ever travel this far north! 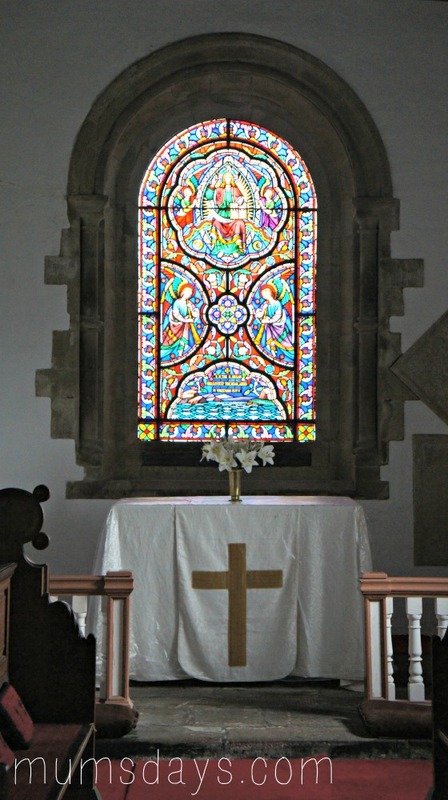 The stain glass window was beautiful too. There was a leaflet but without a bean to my name, I didn’t take one, figuring we’d have to do our research after the event! Cue Wikipedia and a smack to the forehead as I discover William de Felton, who I’ll admit I hadn’t heard of, is buried in the Church Graveyard! 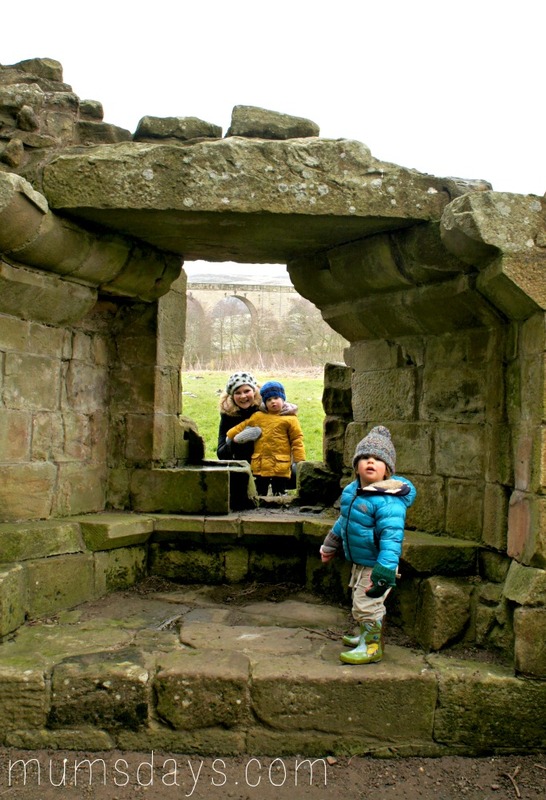 New lesson: do the research in advance… while I thought I might have done some reading there, it’s just too much to try and stop two little boys from mortal danger, take nice photos, and learn about the heritage. In future I will do the prep work in advance so I don’t miss important points. 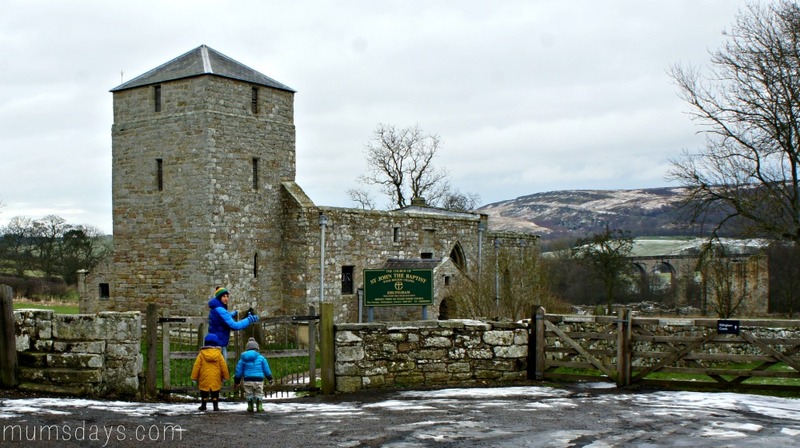 William de Felton apparently acquired the castle back in 1294 before doing various renovations, or ‘fortifications’, to make it stronger in preparation for the 1300-1600 boarder warfare with Scotland. It turns out it was officially a ‘fortified manor house’, which guarded the western approach to Alnwick. 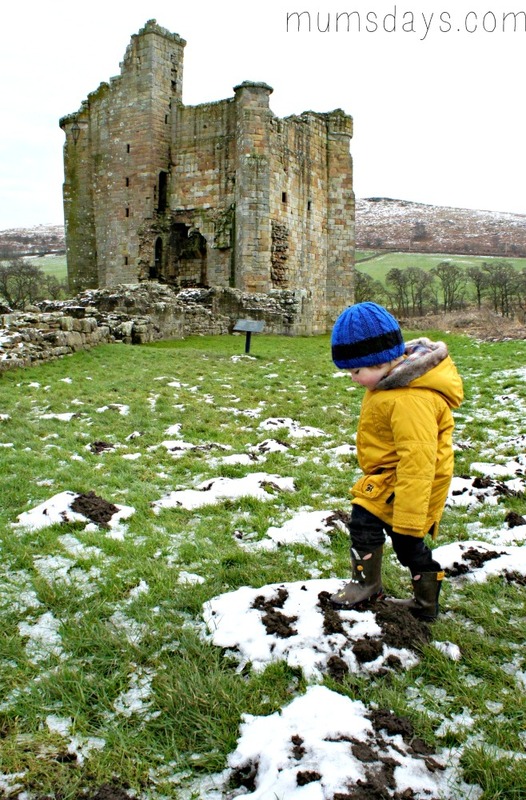 However, unlike nearby Mitford Castle – which had quite the chequered past resulting in it burning down, either by the Scottish or by Royal decree, after Northumbrian rebels took over the castle – Edlingham just sort of fell into disrepair. 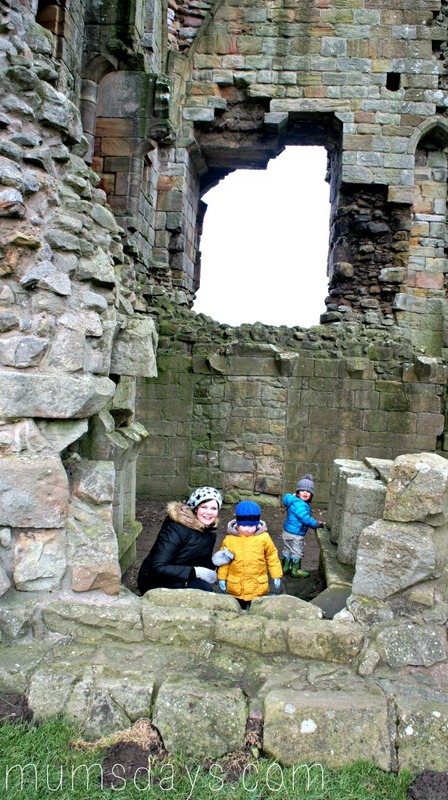 Some of the stonework was even used by locals to build farmhouses in the 1600s! 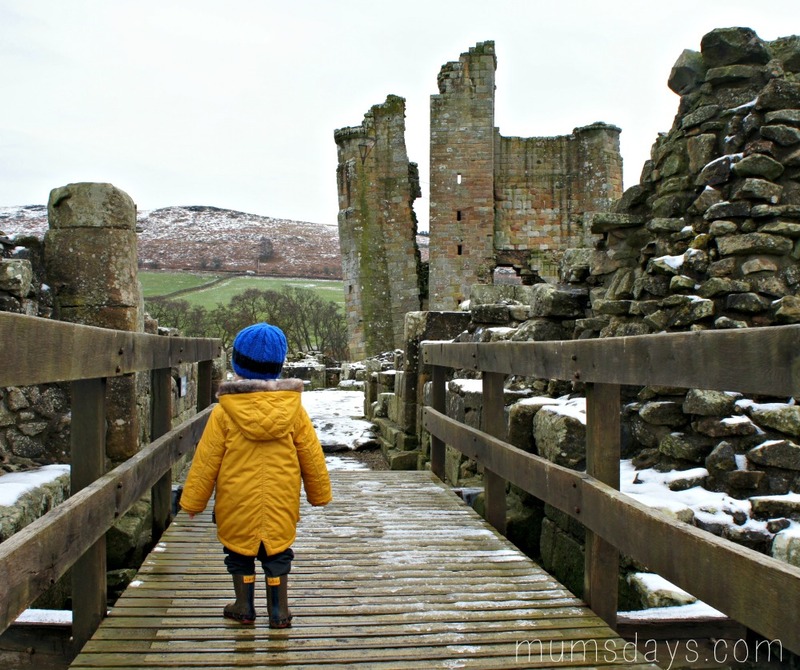 We set off down the path to the Castle with differing levels of enthusiasm – Beau had a certain interest in ‘posting’ his gloves through the fence either side of the path. Meanwhile Reuben ran down the path to the Cassssstle. Didn’t they know we needed to get some nice photos along the way??! 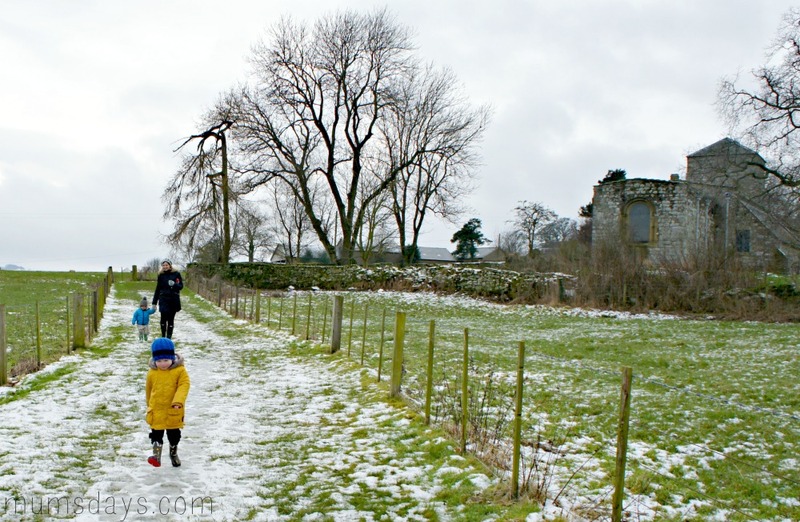 I negotiated the gloves and Emily ran ahead of Reuben (no mean feat in that icy snow!) to try and capture a few shots! Edlingham Castle is stunning! Thanks to the English Heritage, a significant portion of the Solar Tower still stands and much of the ground floor layout can be seen. It was awesome and makes a fantastic backdrop for a few photos…! This is the view from the ‘Gatehouse’, which shows the crack down the Solar Tower. What you can’t see are the metal belts that are literally holding the splinter section up. You can’t beat a bit of Civil/Structural Engineering at work, peeps… that shiz is amazing! And despite a lack of suitable place to put my camera AND the fact I had to run across ice, check out this much more awesome group shot!! In hindsight we should have stood in front of that gutter, but still, a definite improvement on last week. 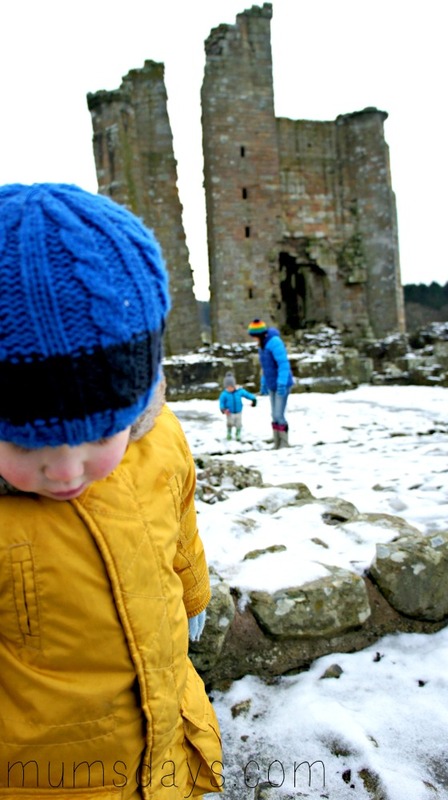 As with Mitford Castle, you do need to keep your eagle eye on little ones as there are potential hazards all over the place, but in general, they just loved roaming around and climbing on stuff…an ancient moment for a playground. That is pretty wicked! 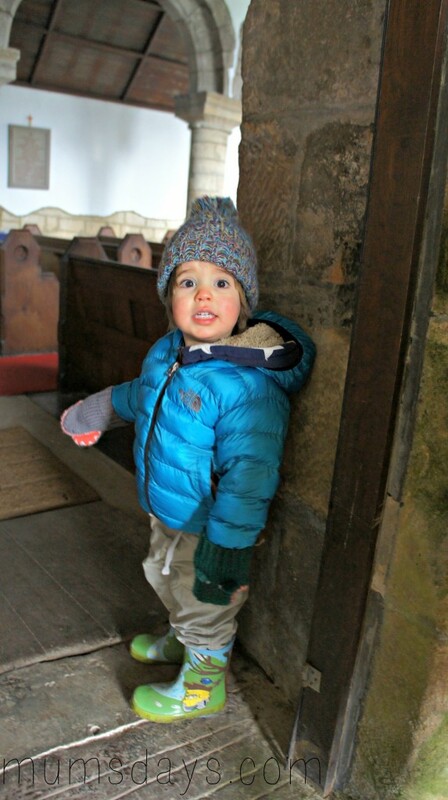 It was around this point that Reuben informed me that “I’m exploring” – ahhhhhhh! After a good poke around and getting suitably cold and wet, we headed back up the hill with the promise of cake. Unfortunately Reuben had saved all his running for down the hill, so I had the task of carrying him, but I guess you have to work for the cake. 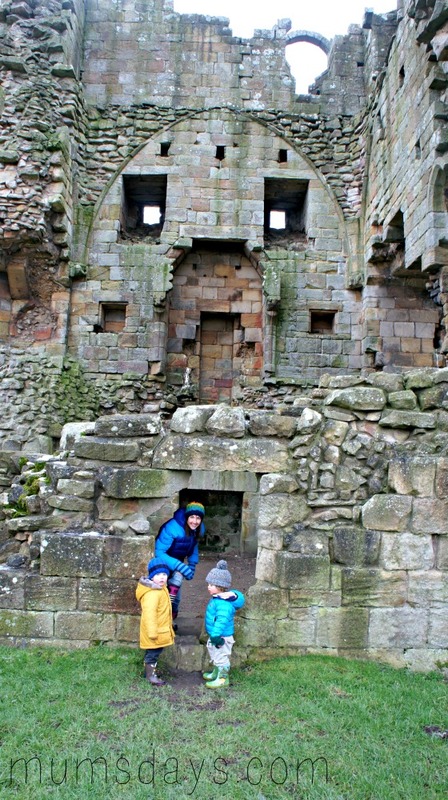 So, that’s the third instalment of the Northumberland Castles Challenge! 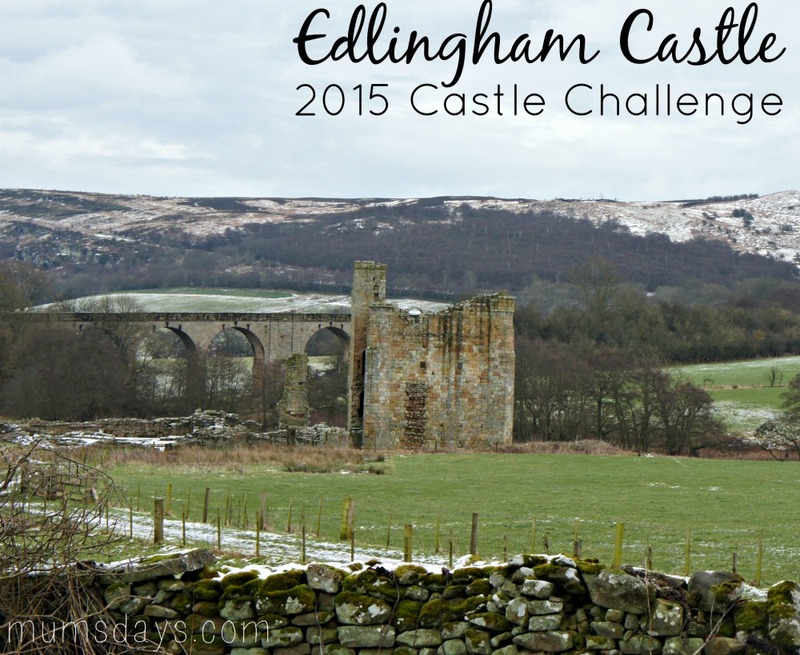 What do you think of Edlingham Castle? Pretty awesome huh?! Tune in next week, when we’ll hopefully have another for you…I’ve not decided which yet, but I will have a plan for the next 3 months trips, very soon so you can join us too! 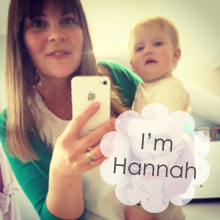 I just love this series on your blog – I love learning about the history. Please continue! I’m so jealous that a) I don’t drive and b) even if I could there is nowhere as stunning as this anywhere near us!